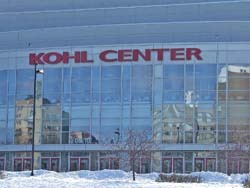 The Wisconsin Badger women&apos;s basketball team used some home cooking in Sunday&apos;s 70-57 win over Minnesota in Big Ten Women&apos;s basektball action at the Kohl Center (pictured). The game was played in front of 15,269, a number that ranks fifth on Wisconsin&apos;s all-time attendance list. That mark, to date, also is the fifth-largest single game in the nation this year. Four players reached double figure scoring, led by junior Janese Banks, who finished with a game-high 20. Jolene Anderson scored 15 points while rookies Rae Lin D&apos;Alie and Mariah Dunham tallied 14 points and 11 points, respectively. Wisconsin coach Lisa Stone will be writing a check to Gilda&apos;s Club of Madison, a free, non-profit support community for anyone touched by cancer. Stone pledged .25-cents for every ticket purchased to yesterday&apos;s game against the Gophers. The 15-thousand plus fans will mean Stone will donate $3,817.25.